I must admit, Park Restaurant has been on my radar for a long time. Chef Antonio Park’s creations are often featured on social media and are out of this world. He is also a judge on the Food Network Canada‘s Chopped Canada. Antonio and I connected on social media several years ago, and this past year has been no small feat for him. In November 2016, this Westmount, QC pillar succumbed to a five-alarm fire. Antonio’s other restaurant Lavanderia which was also located at 374 Victoria Ave was also affected. The support of the community, the city of Westmount and service providers helped see Park Restaurant come back to life in an outstanding three and half weeks! I was very excited when the restaurant re-opened and I took it upon myself to include a visit during my next trip to Montréal. It also placed 45 in Canada’s Top 100 Restaurants 2017. My wife and I visited the restaurant for lunch on a Saturday. Having promoted my travel to Montréal and my lunch plans, we were kindly seated at the Chef’s table at the end of the sushi bar. The dining room isn’t very large but features amazing wood and textures. It’s bright and welcoming with some spectacular chandeliers. A beautiful glass wine cellar and an open concept kitchen nestled behind the sushi bar. We had the utmost pleasure to have Chef Antonio Park prepare our dishes. There was no doubt in my mind that omakase was the only choice. Omakase is a meal consisting of dishes prepared and chosen by the chef. How could we go wrong when the man himself was taking care of us! Here’s a look at our adventure! Beautiful fresh seafood, amazing dashi, flavours and aromas were spectacular. 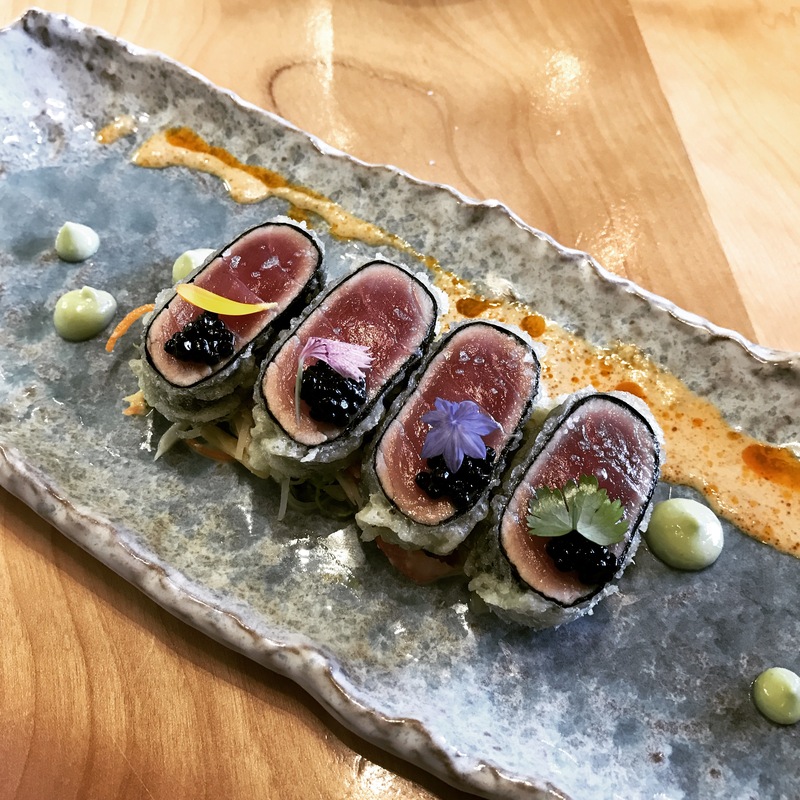 The beautiful flavour of the Bluefin Tuna was elevated by the saltiness of the Spanish Black Caviar. Out of this world combination. This was not your normal Nigiri. Served on a 4-foot wood plank, 8 pieces of perfectly sliced fish atop firm seasoned rice and topped with different complimenting flavours. From a slice of jalapeño to caviar, the toppings elevated each bite. This process allows restaurateurs to experience almost fresh out of the water sushi. Sweet and amazing flavour! Perfectly seared and crispy skin, cooked to the perfect temperature atop neatly placed house made udon noodles bordered by the most amazing black sesame sauce. OMG UMAMI. Most think it’s sea urchin but really, it’s sea urchin gonads. Yup it is! An amazing creamy texture and a deep flavour. You either love it or hate it. I’m nuts for it! This is one big bite. Beautiful fish flavours, earthy mushrooms and amazing reduction. Japan Meets Canada. We capped our meal off with dessert and truly these deserts were ultra-modern. Very fitting after the most amazing omakase we had ever experienced. I cannot believe we had never made the trip to Park Restaurant before. The product, the service and the quality warrant travel from anywhere in the world! Make the trip – pure perfection.